My sixtieth stadium of 2011 was on Wednesday 7th September 2011 at Notcutts Park in Woodbridge, Suffolk. The match was Woodbridge Town vs. Hadleigh United in the Ridgeons Eastern Counties League Premier Division. Notcutts Park is 1.3 miles from Woodbridge railway station and sits in a residential estate on the outskirts of Woodbridge. It has been home to Woodbridge Town since it was built in 1990. All the facilities of the ground are placed on the south-east side of the venue. 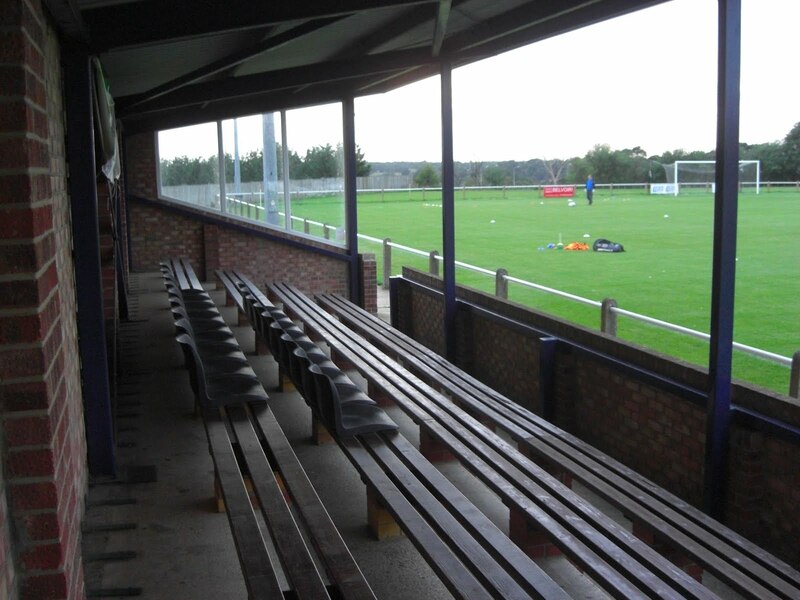 The viewing areas consist of one small all-seater stand mostly consisting of four rows of benches with eighteen seats positioned in the middle of two of the rows. Attached to the right side of this is a small covered metal terrace with raised viewing. Also on this side of the venue is an excellent clubhouse and bar area which is one of the best examples of its kind I have come across at this level. The remainder of the ground is general uncovered standing behind a metal barrier which goes around the pitch. There is netting surrounding the north-east and north-west sides of the venue, with the former designed to stop balls hitting the nearby houses and the latter to stop balls from going over into the A12 main road which runs alongside the ground. The game started with Woodbridge bursting out of the traps to net the opener after just 3 minutes. For the next quarter of an hour Hadleigh were under real pressure but against the run of play they then netted an equaliser which completely changed the game. From this point on it was the visitors who picked up the pace and they scored another two great goals in the space of three minutes to go into half-time leading 3-1. Both sides continued to play openly in the second half but it wasn't until the 80th minute until the next goal came with Hadleigh notching up their fourth of the game from a corner after the Woodbridge goalkeeper missed the ball and it was headed in on the line. With five minutes to go a woefully underhit backpass by a Woodbridge defender was picked up by a Hadleigh attacker who rounded the goalkeeper and slotted home and in injury time the rout was completed when the Woodbridge defence was once again taken apart allowing the visitors to score their sixth of the night to complete a 6-1 victory.